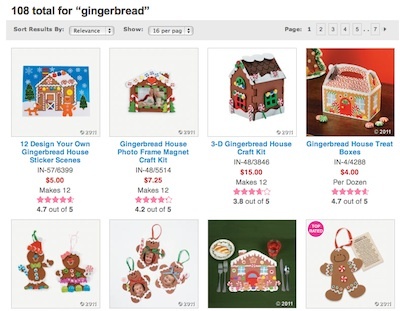 We have seen beads, a few ornament kits, and an occasional door hanging… but this year Oriental Trading has really stepped up the Gingerbread fun! They have 3D Gingerbread house kits and stickers and photo frames and more ornaments and more beads and mugs and… well, over 108 items to choose from. Here is a link directly to their site with the Gingerbread stuff already searched for and pulled together. This used to be the place we would try and get the Gingerbread Holiday light strings, but every year they would run out.